The new RC has been reimagined with a sporty-yet-elegant exterior drawing on the lithe design of the LC flagship coupe. Julge pilkupüüdva kujundusega sportkupee, mis pakub meeliülendavaid sõiduomadusi. RC sportliku ja jõulise hoiaku taga pakuvad lühike teljevahe ja jäik alusraam erakordset juhitavust ja erksust. See omanäoline neljaistmeline kupee on saadaval võimsa bensiini- või hübriidmootoriga, nii saad komplekteerida täpselt sellise RC, nagu soovid. Tänu madalale sportlikule juhtimisasendile tunnetad enda all olevat teed tõeliselt hästi. Lisaks reageerib auto ka kõige väiksemale rooliliigutusele. RC mudelite standardvarustuses on praktilised 60 : 40 suhtega allaklapitavad tagaistmed. Universaalauto praktilisust, kuid sportkupee graatsiat ja rafineeritust pakkuvas sõidukis jagub tagaistmete kokkuklappimisel ruumi suuremate asjade vedamiseks. Kui ligined RC-le, võti taskus, süttivad mõlemal uksekäepidemel tervitustuled ja ukselukud avanevad käepideme puudutamise peale. Kauni vormiga käepidemed on esimesed omataolised maailmas, sest neil ei ole lukuauku. Kauni nahkviimistlusega roolil on sõrmepesad ning tänu optimeeritud põikprofiilile istub see kätte nagu valatult. Suurema mugavuse tagamiseks külma ilma korral saab lülitada sisse roolisoojenduse. Uue RC sõiduki dünaamika integreeritud juhtsüsteem ja võimsad ventileeritavad ketaspidurid võimaldavad sul ohtudest hoiduda. Alusta RC kohandamist oma nõudmiste järgi, katseta värvieelistustega või jätka omaduste ja galeriiga tutvumist. Juhile orienteeritud istekoha, jõulise välimuse ja kaunilt kujundatud salongiga Lexus RC kujutab endast muljetavaldavat tasakaalu suurest võimsusest ja täiuslikust rafineeritusest. Kui üldse mõni sportkupee on loodud elevust tekitama, siis RC võib olla just üks selline. A beautifully crafted leather steering wheel features finger rests and a cross-section optimised to fit comfortably in your hands. Integrated switches control audio, telephone and multi-information display. For added comfort in colder conditions, the steering wheel can be heated. The driver and front passenger can heat or ventilate their leather seats. This adds to the sense of luxury, especially in extreme weather conditions. The RC driver-focused cockpit will keep you perfectly relaxed and concentrated on the road ahead, even on the longest journeys. Behind the beautifully crafted steering wheel, the sumptuous front seats offer numerous electric adjustments. Vehicle performance can be fine-tuned using Drive Mode Select. ECO mode reduces emissions and conserves fuel while, for everyday driving, NORMAL provides an ideal balance of power, economy and ride comfort. For enhanced drivetrain responsiveness, simply switch to SPORT mode. Front sports seats make use of the ‘integrated foaming’ production process. This motorsport-inspired technology allows greater comfort and lateral support than is possible with conventional upholstery methods. Seat cushion shape and firmness have been optimised to reduce pressure on the sensitive ischial region. Positioned between the two main dials, the high-resolution TFT multiinformation display provides a wide range of vehicle information and data. The driver can select the display settings via the steering wheel mounted controls. Engage reverse and the view behind the car is relayed to the Lexus Media Display. On-screen guides are also displayed to assist parking. With vivid 3D graphics and many mapping options, the 10.3-inch screen is operated by Touch Pad or voice commands. The system can even generate a QR code for your smartphone, to help you reach your final destination on foot. Multiple digital applications can be synchronised to the multimedia display. For example, a smartphone’s entire address book can be simply downloaded, and then scrolled through on the display. An iPhone® or other multimedia devices can be viewed and operated via different display screens. The RC's 17-speaker, 835 Watt Mark Levinson® Premium Surround system is tailored to the acoustic properties of the cabin. It delivers a peerless 7.1-channel digital home-theatre experience, enhanced by Clari-Fi™ that rebuilds sound lost in MP3 digital compression. Touch Pad with Remote Touch Interface lets front seat occupants interact intuitively with the central 10.3-inch multimedia display. Ergonomically designed, it is as easy to use as a smartphone or tablet. From a low sports driving position, you’ll really feel the road surface beneath you and sense how the car responds to the slightest steering input. A practical 60:40 split folding rear seat comes standard on the RC. Offering the convenience of an estate car, but with the grace and refinement of a sports coupé, when the rear seats are folded down there’s room to carry bulkier objects. Have a choice between the 18- or 19-inch alloy wheels. The classic 5-twin-spoke design on the 18 inch wheels creates a distinctive profile, while 235/45 R18 tyres deliver a sporty drive. The intricate 5-twin-spoke 19-inch wheel design gives a dynamic look, with 235/40 (front) and 265/35 (rear) R19 tyres for enhanced driving performance. Jewel-like, triple ‘L’ LED headlights use the same light source for high and low beam, with the RC’s impressive aura enhanced by L-shaped thick-wall full LED daytime running lights. Choose between the Self-Charging Hybrid or the 2.5 litre petrol engine. Every Lexus Self-Charging Hybrid is capable of operating in petrol or electric modes alone, as well as a combination of both. 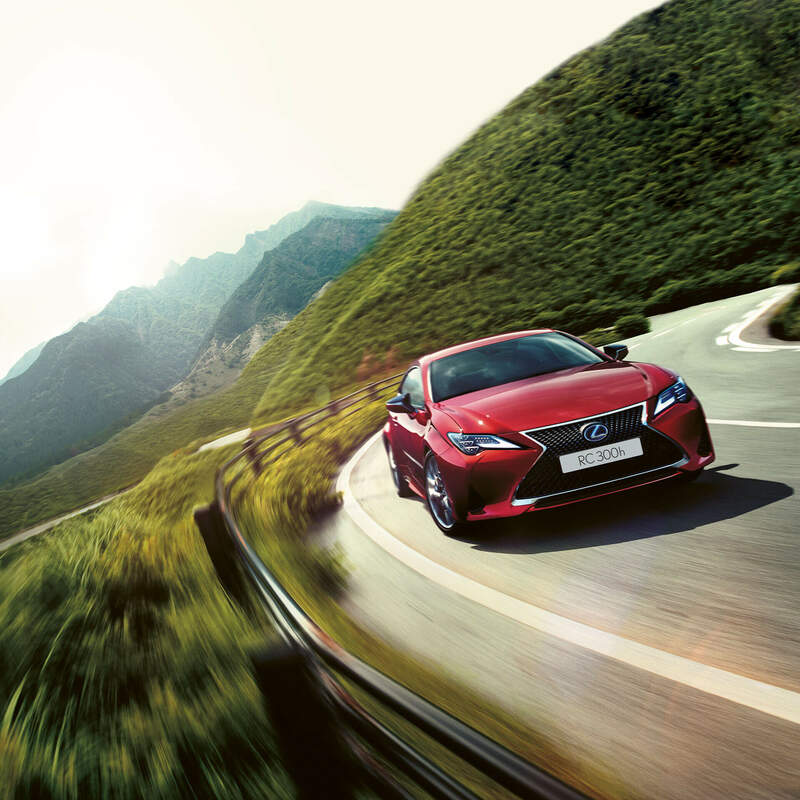 Its Lexus Hybrid Drive system seamlessly combines a Euro 6-compliant, 2.5-litre petrol engine generating 181 DIN hp/133 kW with a powerful 143 DIN hp/105 kW electric motor. Featuring forged aluminium components, the double wishbone front suspension is lightweight and responsive. Innovative suspension geometry delivers excellent handling stability and ride comfort. Straight-line and cornering stability are supplied by a multi-link rear suspension setup. A combination of high-tensile steel and die-cast/forged aluminium components keep weight low but ensure vibration-free precision. The foundation of the RC's agility and excellent road holding is its highly rigid body, which features large cross-section rocker panels, a strong front lower brace and other strategic reinforcements. Numerous specialised Lexus manufacturing techniques enhance rigidity, including bodywork adhesives, laser-screw welding and extra spot welding. The rear light cluster combines elegant LEDs arranged in Lexus signature ‘L’ form. Thick-wall moulding technology gives a crystal appearance, and a strikingly bold presence even when not illuminated. SHARP YET SMOOTH COMES ACROSS IN THE DIFFERENT DRIVING MODES, FROM A VERY SPORTING FEELING TO A VERY COMFORTABLE FEELING. The exclusive pop-up event was held a month ahead of the Lexus RC coupe’s world premier at the Paris Motor Show 2018. Chef Møller of restaurant Copenhague on the Champs-Elysées, whose skills were honoured with a first Michelin star earlier this year, envisioned a dish that translates the essence of the reimagined RC to deliver something truly remarkable. Tutvu RC-ga iga nurga alt.